Bonjour Singapore: Fashion blog with a focus on Asia: Bonjour Beirut: Azzi and Osta and the battle against bling! Both designers are graduates of S-mode Beirut and have done their internship with none other than Elie Saab himself, the champion of elegant and feminine style. But while they have high regards of Saab’s techniques and timeless style, they have taken a much more understated approach to glamour which is based on vintage silhouettes of the 40s and 50s, of course with a modern twist. 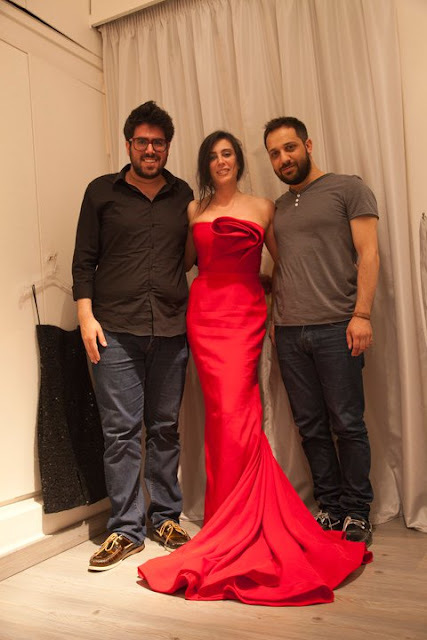 On my recent visit to Beirut, I met with Assaad and Georges at their cozy atelier in downtown Beirut and to say they were busy is an understatement! Entering the door of the unnamed apartment (it’s way cooler not to have a big sign for designers these days) my eyes started wandering from one dress to another. The colours and fabrics were captivating even on the hanger. Delicate and feminine, these pieces are meant to make the wearer stand out – in a good way. 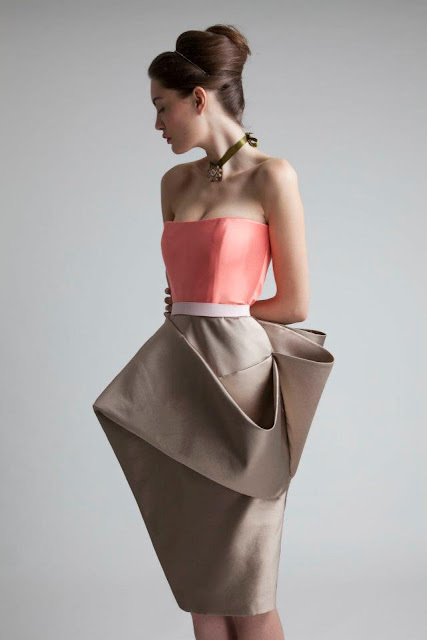 Beautiful and understated... love this dress! The philosophy is simple. You have to wear the dress instead of let the dress wear you, which is unfortunately a big mistake a lot of women make in places like Lebanon. They go for the extremely loud and over-embellished gowns (yes that’s to attend someone else’s wedding!) and end up looking like mutton dressed as lamb! The beauty of Azzi & Osta pieces is that they are simple but flattering and they complement the woman instead of drowning her. 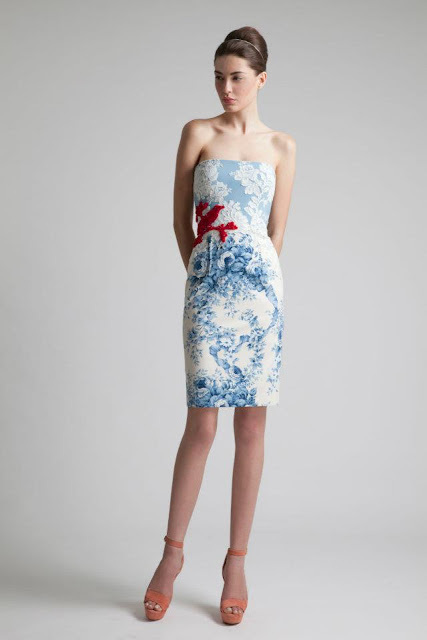 A lot of the dresses have no beading or embellishment and are made in beautiful tailoring and detail. The colour of the dress (especially those jewel-toned ones) and the luxurious fabric make it stand out – it is more like going back to the essence of the dress and how making you feel beautiful and comfortable are key. But again, they don’t go as far as Victoria Beckham in that sense. There are still some very interesting details, sometimes quite Avant-garde and daring which the designers confess that not everybody is a fan of. Although some Kuwaiti fashionistas come just for these! One beautiful dress caught my eye in the atelier, a white structured and strapless dress which envelops the body and makes it look like a blooming flower. I just love how pure yet creative the cut is and the play on a vintage look with a very post-modern form. It is more like a work of sculpture and art really. Other designs which stood out are the silk figure-hugging dresses in dark and jewel tones which could be a great – and more stylish- alternative to full chiffon gowns. I liked the simplicity of the design and the flattering silhouette which is all what a modern woman needs to love a dress. still stitching it on the mannequin... looks amazing! dress. Love the hint of red in the embroidery! proved popular with a couple of Kuwaiti fashionistas! kudos to them! Azzi&Osta work on custom-made pieces most of the time since great fit is key for their designs. Some clients can also do small alterations on the designs which makes the whole thing a very unique one-on-one experience. Leaving the atelier, I found it even harder to understand the logic of people who buy a ready-made Swarovski-covered dresses for a hefty price tag when they can custom-make one for the same price. The mind boggles. Simple and elegant... who needs beading and embroidery? rather than the already world famous Elie Saab.